A Russian Mi-8 helicopter has been shot down by ground fire in Syria following delivery of humanitarian supplies to Aleppo, the Defense Ministry said. Three crew and two officers from Russia's Reconciliation Center died, according to a Kremlin statement. The Russian military transport Mi-8 helicopter was shot down in Syria on Monday over an area controlled by Al-Nusra Front, Russia’s General Staff said. “The helicopter was hit from the ground in an area under control of the armed units of Al-Nusra Front terrorist group and the troops of the so-called ‘moderate opposition’ who joined them,” General Sergey Rudskoy, chief of the main operations department of the Russian General Staff, said. Russian helicopter on Aleppo aid mission shot down. "On August 1, an Mi-8 transport helicopter has been shot down by ground fire in Idlib province after a delivery of humanitarian aid to the city of Aleppo. Three crew members and two officers from the Russian Reconciliation Center in Syria were on board," the Defense Ministry said in a statement earlier on Monday. The helicopter was returning to the Russian air base at Khmeimim, the statement added. The ministry has not yet revealed identities of those on board. The Russian Reconciliation Center in Syria has operated at Khmeimim air base since February. It contributes to peace talks between Syrian government and moderate opposition factions not aligned with IS, Al-Nusra Front or other terrorist groups. The center also oversees ceasefire agreements between belligerent parties and delivery of humanitarian supplies to various parts of Syria. Kremlin spokesman Dmitry Peskov confirmed in a statement later in the day that all those on board are dead. “Those on board the helicopter were killed, as we learned from the Defense Ministry's report. They died heroically as [the crew] tried to divert the helicopter to minimize casualties on the ground,” Peskov said, adding the Mi-8 had been on a humanitarian mission. "The Kremlin conveys its deep condolences to the families of those killed in action," he added. Shortly after the crash, a number of on-the-spot videos have emerged online, allegedly showing helicopter debris, including a tail rotor and parts of the fuselage. At the moment, RT cannot verify authenticity of those videos. Last week the Syrian government and Russia launched an effort to evacuate civilians wishing to leave Aleppo, establishing safe corridors and providing food, medical assistance and transport for those who chose to use them. Scores of people, mostly women and children, rushed to abandon the battered city, which has been contested by several armed forces. The Syrian opposition decried the move, claiming it was an attempt to depopulate the city, a part of which remains one of its strongholds. Terrorists in the eastern part of Aleppo have executed four people over an attempt to flee the city via humanitarian corridors, said Rudskoy. “Considerable losses don’t bother the militant leaders, who are pulling up reserves from other directions and are intimidating the government troops. They are preventing the local population from leaving the area of hostilities and continue using civilians as ‘human shields’,” he said. The Syrian Army has lost several aircraft over the last two months, indicating that militants may have received new anti-aircraft weapons lately, freelance journalist Alaa Ibrahim told RT. "I’ve heard some local sources where the [Russian] helicopter was downed speaking of the possibility of MANPADs – shoulder-mounted surface-to-air missiles – being used in that context," he said. Portable surface-to-air missiles would be a game changer in the hands of the rebel forces, as they counter the Syrian Army’s air superiority. Providing such weapons would be a risky move for a foreign nation, considering the previous record of unintended weapons transfers. It is the third Russian helicopter lost in action in Syria this year. 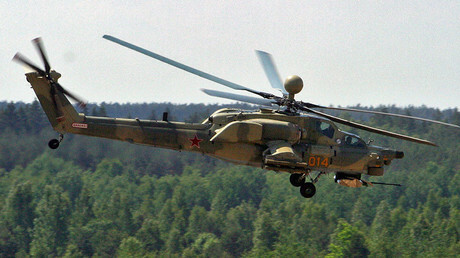 In July, an Mi-25 attack chopper was shot down near Palmyra, killing two Russian pilots. The aircraft had been engaging the advancing Islamic State (IS, formerly ISIS/ISIL) militants at the Syrian Army's request when it was taken down, according to the Russian Defense Ministry. In April, an Mi-28N attack helicopter crashed while performing a flight near the city of Homs, with the Defense Ministry stressing it was not shot down. The crash left both pilots dead, with technical failure cited by Moscow as the likely cause of the accident. Last October, another Mi-8 helicopter was badly damaged and then destroyed by IS fighters after an emergency landing in the middle of search and rescue operation to extract a surviving co-pilot of a Su-24M bomber jet shot which was down by a Turkish Air Force F-16. The number of Russian servicemen who lost their lives since the start of the country’s anti-terror operation in Syria on September 30 last year stands at 19 people after the downing of the helicopter. 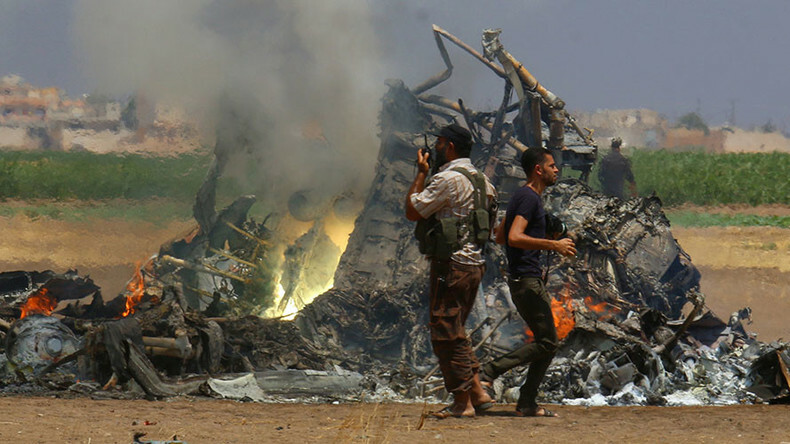 Commenting on the alleged videos from the crash site that surfaced online, political analyst Taleb Ibrahim condemned the people in the footage for the “brutal way,” in which treated the bodies of the crew. “It was same as Al-Qaeda, the [Al-] Nusra Front deal with the bodies of the Syrian Army soldiers and others,” he told RT.